In a food processor or blender, process the lemons, olive oil, salt, pepper and harissa into a fairly smooth paste. Taste and adjust harissa, salt and pepper to taste. Rub into the hens. Preheat the oven to 425°. Place the hens in a small roasting pan or ovenproof dish lined with parchment paper. Roast for about 45-50 minutes until nicely browned on top and cooked through (juice will run clear if you pierce the thigh), 165° on an instant-read thermometer. Serve and enjoy! My verdict: Great and super easy! I actually made the paste the day before and marinated the birds overnight in a Ziploc, so all I had to do was heat the oven and pop them in. 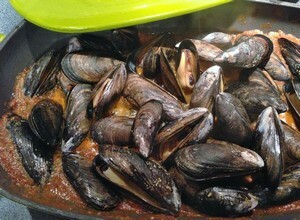 Served over couscous with some of the sauce spooned over them and a little sautéed spinach on the side and this was a delicious weeknight, tired-cook dinner! I make my own preserved lemons-they’re so easy and good. That way they’re always on hand and for this, I just used one large one, which gave the marinade plenty of flavor. The harissa I use is on the mild side. If yours isn’t, adjust it to suit your taste. If it wasn’t winter, the hens might have gone straight to the rotisserie, or gotten butterflied and grilled (and probably will as soon as the weather is better). Having the hens also gave me the idea to taste-test between two well-known brands. Click here for the results. The Accidental Locavore thinks that one of the great pleasures of being in France is the availability of great roasted chickens at almost every butcher. Poulet roti has been elevated to an art form (and is one of the main reasons we could never buy a grill without a rotisserie). 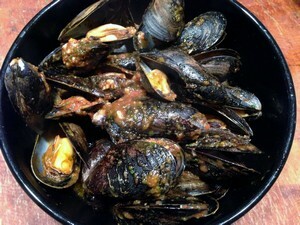 So, when I saw this recipe in David’s My Paris Kitchen, I knew I had to give it a try. If you’ve never butterflied a chicken, it’s really easy, but if you’re fearful just ask the butcher to do it for you. The chicken needs to marinate so give yourself time. This could feed up to 4, depending on how greedy you are. Put the garlic and salt in a large Ziploc bag (big enough to hold the chicken) and crush it with the heel of your hand to make a paste. Add the rest of the ingredients, except the chicken, and mix well. Add the chicken, massaging it well with the marinade (be sure to get it under the skin as well). Refrigerate it for 1-2 days, flipping the bag over to distribute the marinade. When you’re ready to cook the chicken, heat the oven to 400°. Heat a cast-iron skillet or grill pan over medium-high heat. Place the chicken skin side down on the pan with a sheet of aluminum foil on top. Weigh it down with a brick, weight, or a large pot filled with water. 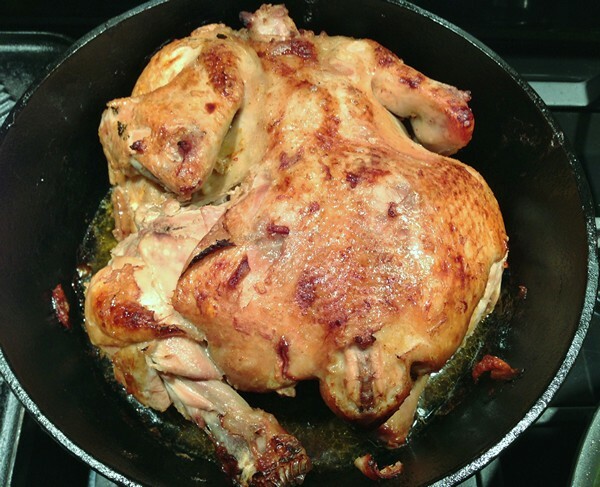 Cook the chicken until the skin is a deep, golden brown about 10-15 minutes (check it often). Once it’s browned, carefully turn it over and put the foil and weight back on it. Cook for about 5 more minutes. 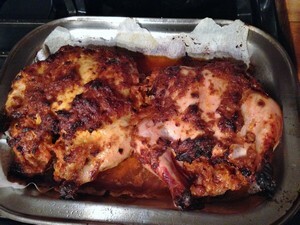 Remove the weight and foil and put the chicken in the oven to finish cooking – about 25 minutes. Chicken is cooked when an instant-read thermometer reads 165° in the thickest part of the thigh. Serve and enjoy! *To butterfly a chicken: With a pair of kitchen shears, cut out the backbone of the chicken. Snap the rib bones, so the chicken lies flat. I usually do this by grabbing it on either side of the ribs and opening it like a book. You can also do it by putting the chicken on a cutting board, skin side up and pushing down on it to flatten it. My verdict: Oh dummy me! I couldn’t get the chicken to brown and now I know why. I put it in the pan, weighted it, and put the whole thing in the oven. Duh, it’s supposed to stay on the stove top until you remove the weights. 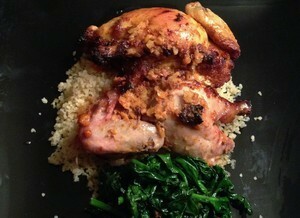 While my skin was never brown and crispy enough, it had great flavor from the marinade! Before I realized my mistake, I was thinking that next time (because there certainly will be a next time), I would pat the chicken dry after pulling it out of the marinade and/or keep it whole and put it on the rotisserie on the grill. Either way, in keeping with French tradition, a few chunks of potato (par-boiled until just shy of cooked) tossed in with the chicken before it goes in the oven, or underneath on the rotisserie would be a great addition. The Accidental Locavore’s Internet friend, Jeff Parker, posted this great sounding lamb recipe a few months ago. Months of bad weather and strange weekend plans kept this from happening until this past weekend, when finally, lamb met rotisserie and, boy, was it good! Don’t be afraid of butterflying anything. It’s super easy to do and sounds terribly impressive when you tell your friends, “Well, first I butterflied this _______,” doesn’t it? Butterflying is just a matter of taking a knife and essentially using it to unroll a piece of meat. I used about a 3-pound boneless leg of lamb (gives you a running start on the butterflying) and it fed 4 people with just enough left over for a big sandwich. Yum! I started with Jeff’s recipe, but since I’m incapable of following directions, made a few changes. This needs to marinate overnight, so plan ahead. In a small food processor or mini-chopper add the garlic, mint and cilantro. Pulse until finely chopped. Add the harissa and process until you have a chunky paste. Lay the lamb out flat on a work surface. Smear the lamb with most of the harissa paste. Roll it back up and tie it, about every two inches with butcher’s twine. Spread the rest of the harissa on the outside of the lamb. Put in a Ziploc bag and refrigerate overnight. An hour before you’re ready to cook, remove the lamb from the refrigerator. Remove the lamb from the marinade and toss the bag. Run the rotisserie rod through the lamb and fasten with the end pieces (you know how your rotisserie works). Light the rotisserie part of your grill and attach the rod with the lamb and close the grill cover. Check the lamb after about 30 minutes, it should be 135° for medium-rare. Remove from the heat and let it sit for about 15 minutes. Remove the rotisserie gear, slice, serve and enjoy! My verdict: I knew I’d be sorry I waited so long to try this, and I was! It’s delicious. 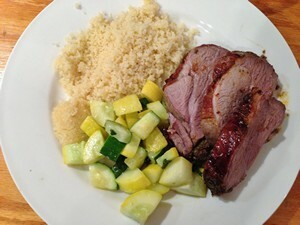 I served it with some couscous and a mélange of sautéed summer squash. The only downside was that either our lamb was too small or the grill was too hot. We cooked it for about an hour and it ended up quite well done. However, it was still juicy and tender, just not as pink as I would have liked it. 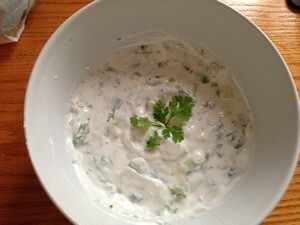 I made a version of Jeff’s yogurt sauce (see below for recipe)and it was a wonderful accompaniment with the meal. If you should be so unfortunate as to not have a grill with a rotisserie (trade it in immediately! 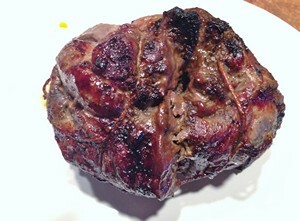 ), don’t tie up the lamb and just grill it flat, about 15-20 minutes a side. Add all the ingredients to a small bowl. Stir well to combine. Refrigerate until ready to serve.